At 13:22 hours on the afternoon of September 19th, the Inwood Fire Department was dispatched to a reported house fire at 17 Mervin Street between Morris and Bayview Avenues. At the time the call went out both the Inwood and Lawrence-Cedarhurst ladders were out of service. Upon arrival Inwood’s Second Assistant Chief  was met with fire showing from two bedrooms in the three four corner of the home on the second floor. The signal ten [working fire] was immediately transmitted and the request for mutual aid began. Inwood Rescue 318 arrived quickly on scene and assumed the truck company duties, but ladders were still needed to the scene. Hewlett Ladder 303 was the first ladder on scene followed by Woodmere Ladder 352. 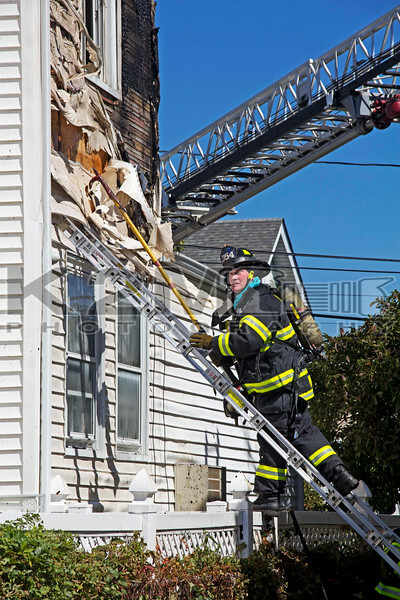 Members of both ladder companies saw work during the operation and so a new ladder was needed. Long Beach Ladder 2372 responded to the scene and became the FAST. The daytime fire began to burn into an exposure on the number four side of the original fire building. Truck company members were assigned to the exposure building to ensure all fire was out. Two lines stretched and operated with at least one line off of first due Inwood Engine 311. Also on scene were Lawrence-Cedarhurst Engine 322 and Rescue 324. Upon arrival the chief requested an ambulance to the scene forthwith and it was later stated this was for a minor injury to a civilian. Standing by for Inwood during the operation was Valley Stream Engine 342 and Ladder 345. Within thirty-five minutes the scene was declared under control [signal 12 transmitted]. The cause of the fire remained under investigation.